Each raft comes with a basic selection of raft support and survival equipment. Particularly with the less expensive rafts, the equipment is minimal, often less than good judgment would suggest. More expensive rafts generally have a better and more complete selection of equipment and supplies. Most rafts are available with only basic equipment or with Part 91 or Part 135 survival equipment packs (SEPs), as well as packs optimized for various other countries' regulations that have minor differences in required equipment. The reference to the FARs is somewhat misleading and, as noted previously, may or may not be a requirement for the flight, depending upon a lot of circumstances. In particular, Part 91 requirements don't cover those of us who fly typical GA light aircraft. In any case, each part in he regulation enumerates the equipment requirements for operations conducted under those FARs when a life raft is required. They are minimums, and very loosely worded minimums in some cases. The manufacturers will gladly supply a list of the equipment they provide. What they do not give any indication of is the quality of that equipment or how it is packed. We asked for our test rafts to be equipped to meet Part 135 requirements, which offers the most comprehensive supply of goodies. GA rafts and some others were also supplied with Part 91 kits in some instances. The diversity and quality of the equipment provided ran the gamut from great to just awful, often within the same kit. The basic items are just that, the bare necessities to maintain the raft itself. Part 91 equipment and Part 135 provide minimal survival equipment and supplies, with part 135 primarily offering more in the way of water and food. From our perspective, we'd consider anything less than Part 135 equipment as inadequate. We'll start by examining what remains of the basic raft equipment, some of which, like the mooring/inflation line and sea anchor, we have already covered. A manual air pump is an absolute necessity. While the raft is supposed to inflate from the gas cylinder, things do go wrong on occasion. More often though, the hand pump is used to manually top up the raft due to slow leaks or the temperature differential between night and day, and for reinflating a cell after a puncture, plus inflating the manually inflated floor where applicable. TIP: Life rafts breath...sort of. In all but the coldest climates and worst weather, the higher temperatures during the day and the sun's rays combine to heat the gas inside the tubes. The resulting expansion of the gas causes higher pressure which causes some gas to be released via the raft's pressure relief valves. When things cool down in the evening or when a storm blows in, the gas compresses, leaving the buoyancy tubes less than fully inflated and often quite soft. Thus, you must use the air pump to top up the inflation in order to keep the raft fully inflated at all times. Note that one manufacturer, Air Cruisers, recommends plugging the PRVs immediately after the initial inflation. This would preclude this venting. All the rafts except RFD used similar pumps: a round 5 1/2 inch diameter rubber bellows with a means provided for holding on to one end to expand and collapse the pump and at the other end an attachment mechanism to accommodate the topping valve installed in the raft. A one-way flapper valve inside the pump keeps the air going in the direction you want. While the pumps are similar, they are manufactured by a number of companies for the raft manufacturers. Winslow's pump was unique in having an internal spring that expanded the bellows automatically, a highly appreciated feature that made using Winslow's pump much easier and less tiring. These pumps are designed with two different connection systems. One uses a threaded connector to attach to the topping valve in the raft. You rotate the entire pump to thread it into the valve. The plated steel valve itself is manually opened and closed by rotating it a number of turns from full closed to full open. Only Survival Products on its unapproved rafts and Hoover continue to use this valve design today. It is very easy to over-tighten the topping valve and then not be able to open it again using finger strength alone. With this valve design it is critical that some sort of pliers be included with the raft in case this happens. Only BFGoodrich, in its older 7-person raft, included pliers as part of the raft equipment. The Mirada quick connect topping valve has become the new industry standard and is used by Air Cruisers, EAM, BFGoodrich, Winslow and Survival Products in their TSO'd rafts. This utilizes a bayonet style connector and anodized aluminum valve. The male portion plugs into the female, opening the integral spring loaded check valve in the process. A rubber o-ring in the valve fits into a mating groove in the plug, no other means to secure it in the valve is provided, so it will eventually pop out when the cell is filled to high enough pressure. It can also be inadvertently pulled out when you pump it vigorously and are not careful. Survival Products are using a unique multifunction valve from Mirada that acts as both the pressure relief valve (PRV) and the topping valve. This valve includes a protective screen fitting which can be (actually, it should be) removed once the raft inflates. An attached metal cap is used to plug the valve afterwards. The male bayonet fitting screws onto the threaded portion of the manual pump that would normally be used for connecting to the old style valve. Some manufacturers pack the pump and fitting as a single unit, others require you to attach the bayonet fitting to the pump before use. We prefer the former, just one less thing for a survivor to have to worry about. Each Mirada topping valve has an attached rubber friction fit cap to provide added protection and keep water and other contaminates out of the valve. The cap, attached by a short piece of rubber, is part of the rubber gasket that provides the seal between the valve itself and the threaded receptacle which is bonded into the raft. On the combo valve the metal cap is also attached via this gasket. Both Air Cruisers and BFGoodrich use a molded recessed receptacle to hold the topping valve. This presented some real problems when attaching the pump to the valve because the attached rubber cap now gets in the way of the pump body. It must be carefully positioned out of the way in order to attach the pump. As noted earlier, all the rafts include topping valves. Locating those valves or instructions for use can often be difficult. Most of the rafts had placards stenciled next to the valve stating the obvious, "VALVE." Then there's SPI's "INFL/DEFL VALVE," which wile technically correct just confuses the issue seems to us. Hoover's placards include instructions for opening and closing their rotary valve, which is helpful. Typically, these are all hidden behind or under someone sitting in the raft. Rather than putting their placard next to the valve, Winslow places bright orange placards on the upper portion of the tube with arrows pointing down to the valve. Between the bright orange and their being up where they will more likely be seen, finding the topping valves on the Winslow rafts was a cinch. Another notable difference between manufacturers is the pump's stroke, which directly relates to capacity and ease of inflation. SPI's unapproved raft and BFGoodrich had fewer bellows and very short strokes. The other rafts were equipped with better pumps with more bellows and longer strokes. In 2000 we actually rigged up a test to measure the capacity of the pumps. The TSO C70a requirement is 32 cubic inches per full stroke. Hoover came out on top with over 50% greater capacity, followed by Winslow and SPI's TSO'd raft with about 40% greater capacity. EAM, BFGoodrich and Air Cruisers had only about 75% of the TSO required capacity, falling far short of the regulation requirements. A pair of nylon webbing finger loops are provided to grasp the pump. On the BFGoodrich, EAM and Air Cruisers pump, your knuckles ride against the aluminum pump plate. The others have webbing running beneath and were somewhat more comfortable as a result. However, with the exception of Winslow's, none of these is particularly fun to use. Many testers just grabbed the top of the pump in their hand and pumped in that manner rather than use the finger loops. The short stroke pumps were particularly derided by the volunteers. On the other hand, Winslow's spring-loaded pump received enthusiastic reviews because it was so much easier to use. Both RFD rafts have plastic inflation valves which have a friction fit opening and a rubber butterfly valve. The valves seemed to operate effectively, though if some air is vented by pushing an object down the valve, they often leaked initially when allowed to close and needed to be tapped to seat properly. Each was also equipped with a friction fit rubber cap which was attached to the valve by a loop of small diameter nylon twine. The cap for the valve on the boarding ramp buoyancy tube came loose from its valve in our test. These caps seemed adequate to retain pressure. They were especially tight if dried well before insertion, though that's not always possible in a survival situation. The RFD manual pumps are equipped with a large diameter, approx. 1 inch O.D., flexible rubber hose, approximately 36 inches long (estimated, didn't measure), with a plastic male friction fitting on the end. This fitting is inserted into the valve to inflate. It must be inserted tightly or it will quickly pop loose. It does not open the check valve. Airflow alone, under pressure of the manual pump does that. The long hose makes it easy to more comfortably use the pump as the survivor can situate themselves for best performance or comfort. It also makes it easy to pass among the survivors near that particular valve if one person gets tired, a very nice feature. This feature is essential for the "R" series rafts where some of the inflation valves are not inside the raft. For the Navigator, a half dome rubber foot pump, similar to those commonly used to inflate an air mattress, serves as the manual pump and works surprisingly well by hand. We found it easy to squeeze between two hands, fairly easy to squeeze using one hand, though tiring, and easy to work by pushing on the top against our leg or even the raft floor or tube. It can also be used by two persons working together. We'd rate it as very good in this respect. The pump is in the SEP and has no tether, neither the best of situations. The manual inflation pump on the RFD "R" series raft was the worst we've ever encountered, with the exception of the EAM pumps on which the fitting failed completely, and by far the most difficult to use. This pump has a cloth bellows chamber with top and bottom plates and a single loop hand hold/ restraint at the top. The pump itself collapses down to next to nothing, though the large tube attached to it is another thing altogether. There is no way to operate the pump single-handed. It was even difficult to use it with two hands as the flexible cloth chamber moved around when under pressure. The hose was attached with a right angle fitting that made it hard to get a good grip on the bottom of the pump, which is absolutely required. The pump on their Navigator is much. much better, if slightly larger and heavier. This pump is also in the SEP and has no tether. In this case it is even worse, since the kit must be retrieved into the raft. The inflation valves for the canopy arches and boarding ramp are on the outside of the raft, not the best location, in my opinion. 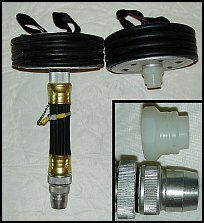 Each main buoyancy tube has two inflation valves, one for operation from each side. The one for the lower tube is accessed via a gusset in the rafts floor and is somewhat difficult to work with. In cold weather it could be very difficult. I have some concerns over the remaining inflation valve being on the underside of the raft, susceptible to damage and virtually unreachable. For a short duration survival situation, that might not be a concern, but a longer duration one, a day or more, leaves us a bit less sanguine about the possibilities. BFGoodrich use of recessed valves make it harder to attach the pump and harder to use the pump two handed as is still sometimes useful for maximum effort. On the larger raft the positioning of the topping valve on the lower tube was too close to the upper such that it was difficult to insert or operate the pumps because the upper tube overhung the topping valve. We had this problem with the Survival Products Type I and Air Cruisers 4-person raft as well. This is just poorly thought out design. The BFGoodrich pump is in a small pouch constructed of orange canopy material and stenciled with "HAND PUMP." It is secured via a tucked in flap. The pump bag is in the raft, tethered to the floor. It was somewhat difficult to get the pump out of the pouch. There is no tether or lanyard on the pump. I consider it a potential disaster waiting to happen that the pump isn't tied off to the raft and could be lost overboard once it is removed from the storage bag. Winslow stores its pump with fitting attached inside a bright yellow polyurethane pouch with a Velcro'd flap and with an orange placard affixed labeled "PUMP." The pump is tethered to the raft and available for use immediately. A Velcro'd strap keeps the spring-loaded pump compressed for storage. Winslow also includes an oral inflation tube as back-up to the pump, a very nice inclusion. A bright yellow laminated placard is attached with instructions for use. The Survival Products pump is tethered to the center of the floor of the raft and was wrapped up inside the bailer, made of buoyancy material, and secured with a rubber band. The fitting is attached to the pump with a nylon twine tether and must be screwed on before use. There is no indication that the pump is wrapped up inside the bailer. Hoover also stores the pump inside the bailer, along with the survival instructions. All are daisy-chained together with nylon line. It is attached to the floor of the single tube rafts. On the Type I raft it is attached to the raft, but must be retrieved from over the side since the raft is reversible. Air Cruisers stores their pump inside the SEP, which don't think is a particularly good idea. No tether or lanyard is fitted so it could be easily lost. The manual inflation pump, which could conceivably be needed to inflate a tube or even the raft itself in case of a failure to fully or properly inflate, should be readily at hand and tethered to the raft so it cannot be lost if being used while survivors are still in the water. We much prefer that the fitting not have to be installed by the survivor. A noted earlier, we had difficulty using the Air Cruisers pump on the 4-person raft. However, that was still lots better than what we found on the 13-person raft. When we unpacked the pump we found it with a 6-inch adapter hose attached to it via a beaded chain. Our initial reaction was that this was a great idea since it solves some of the tight fit problem we had with the other pump. However, our enthusiasm quickly evaporated when we discovered that the bayonet fitting attached to the adapter hose did not match the fittings on the raft, rendering the pump useless. It appeared from the mil-spec labeling that this pump and adapter combo was meant for a military raft, not for this civilian raft. This is an extremely serious and potentially fatal error. One wonders how many other Air Cruisers rafts are out there with the incorrect fitting. While not necessarily germane to this particular problem, but perhaps indicative of Air Cruisers' lack of attention to detail, we couldn't help but note that the beaded chain was attached to the hose with a cable tie that was improperly trimmed, leaving a very sharp tail that cut one of the volunteers. We noted a number of minor and more serious problems with the EAM pump in our first test. While EAM uses the bayonet style fitting, the bayonet adapter is contained in a separate bag attached to the pump and must be screwed onto the pump by the survivor. With no tether attached the opportunity exists for the adapter to be lost overboard in the process of installing it on the pump. Without the adapter, the pump is useless. This is a serious failing, in our opinion. We had another problem with the EAM. It has an aluminum male bayonet fitting and it came out of the valve just about as easy as it went in, despite an o-ring which is supposed to secure it, and that created problems for our volunteers. As soon as they reached the end of the expansion stroke, the pump pulled out of the valve. The instructions for both rafts make no mention of the need to hold the pump into the valve. They simply say to "insert pump in valve and pump to inflate." (Having to hold on to the pump is a drawback in any case. We feel that it is an advantage to be able to pump one handed.) While the solution would seem obvious, it turned out to not be the case. Nor is it very easy. Holding onto the pump is hampered by the lack of any place to easily grasp the pump or bayonet adapter. Wondering if we were just dense, we asked a dozen others to have a try at using the pump. ALL had the same problem. We contacted EAM. We not only wanted to discuss the problem with the pump coming out of the valve with them, we also had a very serious failure with their pump. When one of the volunteers trying to use the pump became frustrated with it popping out, instead of pumping in and out exactly at right angles, he ended up applying force to it at an angle. Actually, that wouldn't be at all difficult to happen in normal circumstances, with the raft and user rolling about in the ocean. The pump fitting that the bayonet adapter attaches to, failed, separating from the pump and rendering the pump useless! We immediately tried the same thing with all the other pumps and there were no similar problems or failures. Given the seriousness of the failure, we thought we'd best get hold of EAM to discuss it. Martin Schwartz, EAM's Chief Engineer, returned our call. After discussion of the popping out problem he admitted that the pump does need to be held in place, especially as the inflation pressure approaches full. Later, in response to our suggestion that perhaps, at a minimum, the instructions could be clearer, in a written letter he noted "Therefore, Eastern Aero Marine does feel it is good advice to indicate that the pump needs to be held in place while pumping." He could not advise when such a change in instructions might be put into production. With regards to the pump failure, he apparently wasn't at all surprised and said "we've had a problem" and they had redesigned the fitting to improve the swedge where it is secured to the pump. He surmised we probably had an "old" pump. We asked to receive a new pump with the redesigned fitting. It arrived promptly and he included a separate fitting and plate assembly so we "could see the swedged installation of the threaded fitting to the plate without having to take the pump apart." On initial examination, the new fitting and swedging looked no different than the fitting which failed. A quick test resulted in exactly the same failure. We called Schwartz with the results and, again, he didn't seem surprised. He commented that "perhaps we need to look at a more secure method, maybe a nut to hold it instead of the swedge." We've asked to see the new design when it was available. They have never supplied one for testing. We also inquired if there were any plans to recall the rafts with defective pumps. He indicated he saw no reason to do so. We consider the failure of the manual pump fitting to be a critical deficiency. We would think that anyone owning an EAM raft ought to take immediate action to identify if their pump may be of this defective design and to rectify the situation. We think any EAM raft with the defective pump is potentially dangerous. In the meantime, pending EAM solving the problem, our best suggestion for someone who must rely on their EAM raft and who determines they have one of the defective pumps would be to purchase a new pump from Winslow or Hoover and attach it securely to the raft. © 1994, 1995, 1996, 2000, 2002 Douglas S. Ritter - All rights reserved.